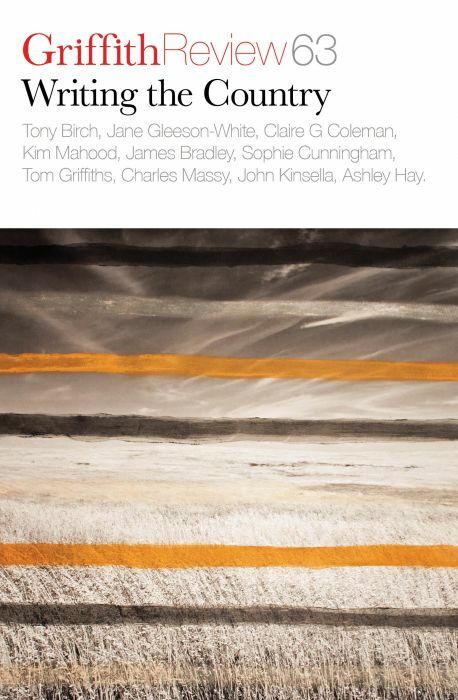 Writing the Country, the 63rd edition of literary magazine the Griffith Review, comprises 32 contributions that explore human connection to country at this time of great change and threat – collapsing ecosystems and accelerating climate change. At close to 300 pages, the volume brims with story and song, science and emotion, with lived connection and commitment across the continent and across cultures. The geographical territory is wide, including tropical Queensland (Ashley Hay’s “Crossing the Line”), Margaret River (David Ritter’s “We All Took a Stand”), the Hawkesbury River (Grace Karskens’ “Life and Death on Dyarubbin”), the Heyson Trail, SA (James Tylor’s photo essay “Turralyendi Yerta”), remote Papua New Guinea (Jo Chandler’s “The Butterfly Effect”) and more. The collection includes stories of conservation efforts past (the ending of the turtle industry on Heron Island, Suzy Freeman-Greene’s “Eating Turtle”) and present (shellfish reef restoration in Port Phillip, Anna Clark’s “Rebuilding Reefs, Restoring Memory”). Contributions range from the conceptual (Tom Griffiths’ piece on big history, “The Planet is Alive”), to the deeply personal (Claire G Coleman’s connection to Starvation Bay, Noongar country, where her ancestors were massacred, “Boodjar Ngan Djoorla”), and the political (Paul Daley’s presentation of governmental and electoral climate politics, “A Change in the Political Weather?”). Memoirs (Kate Veitch, Cassandra Pybus, Sashley Kalagian Blunt, Sophie Cunningham), fiction (Jenny Sinclair, Sophie Overett, Amanda Niehaus and Tony Birch) and poetry (Young Dawkins, John Kinsella, Olga Pavlinova Olenich and Alison Thompson) also feature. A standout for me was Kim Mahood’s essay, “Lost and Found in Translation: Who Can Talk to Country?”. Mahood grew up on a cattle station in the Kimberley and continues to work closely with traditional owners from that region on cultural and environmental mapping projects. She has “been hearing [the voices of country] all [her] life”. In this fascinating offering, she traverses literary grapplings of the European imagination with Australian landscapes, describes her encounters with Aboriginal songlines, and provides insight into exciting developments happening at the interface of different worldviews – thanks to respectful collaborations and technological developments that make it possible to share stories in new ways. Mahood closes at a remote place on the station of her childhood and reflects on the complexities of sharing her own experience. Sampling this collection in the record-breaking summer heat was an experience for me of renewed urgency. In the introduction, publisher and founding editor Julianne Schultz writes that, with so much at stake, and in the face of delay, confusion and fear, the purpose behind the edition is “to restore [a] sense of agency and optimism. To cherish the unique beauty of country and environment at a challenging moment, and to reinforce the point that we do not need to be on suicide watch, that there are lessons to be learnt and things to be done to ensure that a century from now the land, sea and air can continue to be enjoyed and provide sustenance for life and human civilisation” (p.9). Congratulations to editor Ashley Hay, who has brought together a rich volume to which this reader will return for inspiration throughout the year.